This great industrial port grew to prominence as a result of trade with the Americas. That tradition continued in the '60s as the Beatles mounted the first wave of rock 'n' roll's "British Invasion". Actually, the city possesses cultural charms beyond the Beatles. 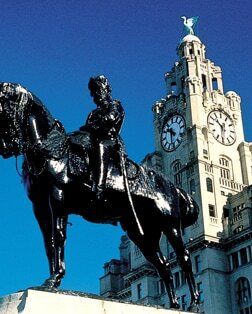 Liverpool is home to two of the finest neoclassical buildings in Europe. At nearby Port Sunlight, magnate William Lever built a model industrial village and created the Lady Lever Gallery. The museum is home to a superb collection of English paintings and furniture. In 1846, the Albert Dock was a working dock. Today, it's a World Heritage site that's home to two hotels, shops, crafts and award-winning visitor attractions. The award-winning Beatles Story experience is a journey into the life, times and culture, including the Fab4D experience through the music of the Beatles and must-see, world-class special exhibitions. Liverpool is home to ancient cathedrals, including the Anglican Cathedral, the largest in the UK, and Christ the King, a Roman Catholic basilica. A cruise along Windermere Lake, England's longest lake, promises magnificent views of the town of Bowness, "the heart of the Lake District," mountain scenery, secluded bays and wooded islands. Chester is considered one of the UK's most beautiful cities, and one of the best-preserved, with some parts of the city walls dating back over 2,000 years. The Liverpool and Manchester Railway was the world's first scheduled and ticketed inter-city railway in which all the trains were hauled solely by steam locomotives. Today, several steam locomotives travel along Liverpool railways. Edward I began construction of Conwy Castle in 1283 as part of his campaign to secure Wales for the English crown. Port Sunlight is a model village in Merseyside, created by William Hesketh Lever for his Sunlight soap factory workers in 1888. Port Sunlight Museum lies at the heart of this garden village. Activity level filters are not available when accessible is selected. Select at least one share check box. Sharing is limited to 5 excursions at one time. You must deselect one or more excursions in order to continue. All prices are displayed in US Dollars unless otherwise noted; excursions priced in other currencies may be available on select voyages only. Prices are based on the amount Princess typically charges for each excursion, but your price may vary by voyage date and departure time. Children age 12 and younger, savings up to 50%. For actual pricing information, click on tour title or Reserve button.